A bunion is a growth of skin that can occur around the tips and sides of a foot. The main difference between a bunion and a corn is the location of the growth, but the cell makeup of the growth is the same. This kind of a growth takes place due to friction against a shoe or other tight fitting item that causes the foot to develop protection against the constant movement. However, over time the buninon can become rather painful in order to walk. That is why the bunion needs to be removed. The bunion can initially be treated the same way a callus is, by gentally removing it through scraping via an emery board. However, over time this skin buildin becomes too painful for this sort of a removal, which is where the bunionectomy comes in. This is also called bunion surgyer and it removes the area that is causing pain. During bunion surgyer, there is an incision made at the top or the side of the large toe, which is generally where the bunion is located. 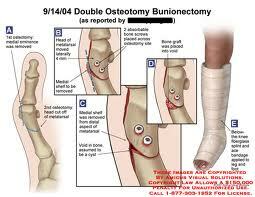 This is done in order to remove the bunion and realign the skin with the bone. Sometimes small plantes are used in order to hold the bone in place, as this can reduce the chance of redeveloping the bunion. It is important for individuals to realize though that bunion surgery is not always going to prevent the development of more bunions or reduce all of the pain. Tyipcally though, the pation should, at the very least, feel more comfort in their foot and regain movement they had previously lost due to the additional pain they might suffer. All of this is important to take into consideration when opting into a bunion surgery in order to remove the bunions from the feet.